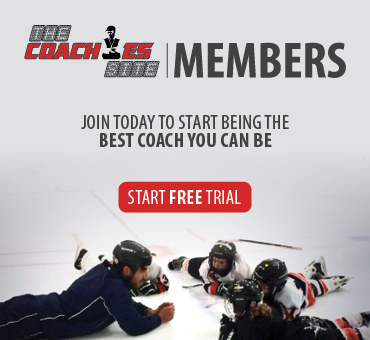 This season we launched the second year of the OMHA Coach of the Month presented by The Coaches Site and asked for nominations of deserving coaches. After much deliberation, Donald Shantz of the Niagara Falls Flyers Minor Bantam A team was selected as the Coach of the Month for January. Don is a non-parent coach who decided to take the reigns this year on a team that really struggled last season. He has gone above and beyond to build the team back up. He has gained their trust to his system, gradually rebuilding their confidence and more importantly the team is having fun again. Don has involved the players in giving back to the game. 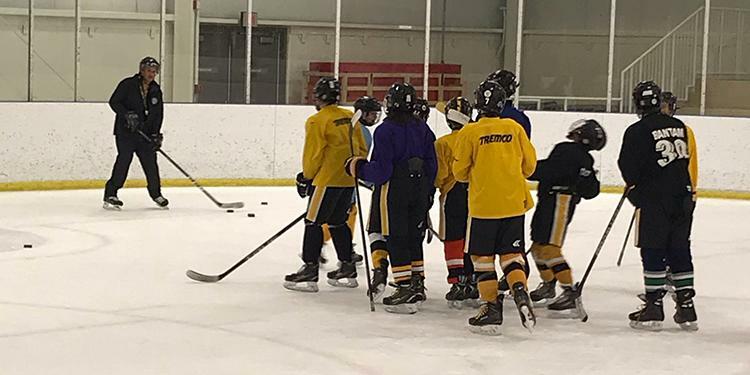 Several teammates volunteered to help with the 2-day house league evaluation sessions. He has also given the players an opportunity to secure their first job as being house league time-keepers for the Association. This is a great way to start their resume along with learning what it takes to be responsible not only by keeping accurate sheets but by scheduling their time to ensure they are on time and prepared for each game. Jobs as teen can be daunting so it's fantastic to see the boys get an opportunity to work around the game they love. Don is on the Niagara Falls Minor Hockey Associations Executive Board as the Novice House League Convenor. This takes up a tremendous amount of time over and above coaching and he does it with passion, commitment and is extremely organized. On top of all this he has 2 sons that play on other teams and he still finds time to watch them as much as time permits. He's committed to hockey as a coach, convenor and a Dad. Growing the game is in good hands with Coach Don. We spoke to Coach Don about what being a coach means to him and his background in the sport. He grew up playing in Niagara Falls Minor Hockey. so when his eldest son was old enough to play in his Tyke year, Don volunteered and got involved. He's coached ever since and at times has been on multiple staffs in any given year. He's served as the Tyke/Novice House League Director since 2016 and is coaching the Minor Bantam A and Midget A teams. You helped some of your players secure jobs as timekeepers in the association. Why did you think this was important? When my eldest son was playing Minor Bantam, our association was looking to train timekeepers. As a parent, I felt that this was a perfect way for him to get an introduction into what it was like to have a job and begin to understand what it was like to work and be paid for a job well done. Remembering some of the lessons my son learned like being on time for scheduled game, the value of money he earned, the confidence he gained from being pushed outside if his comfort zone, I decided to offer it as a program to my Minor Bantam team this year in conjunction with my Tyke and Novice house league. I was happy to see more then half the team take on the challenge of a first job and it has been an absolute pleasure to see them now all confidently do the job for various teams, divisions and tournaments within NFMHA. A number of your players are involved in volunteer initiatives. Is giving back to the community an important part of your team? Giving back to the community (especially the hockey community) is very important to me. Even going back to when I played, there are people that I remember who made a difference in my time in minor hockey. I absolutely believe that this is one of the things that makes hockey so great is how the older players are always willing to give back to the younger players. 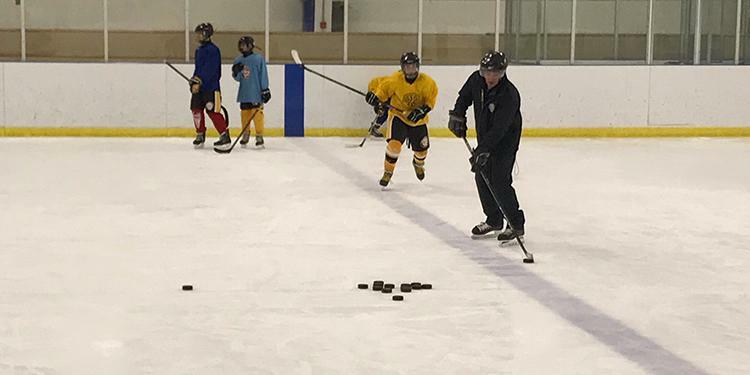 Again, with the opportunity I have of being the Novice/Tyke HL Director in NFMHA, I was also able to offer to my Minor Bantam players the chance to come out and volunteer their time with the younger age group. To see players on my team take their first steps to giving back and volunteering their time is hopefully a life lesson that will stay with them forever. This time together also served as a great team bonding exercise for the players in attendance to which all the players seemed to have fun. Since then, I know of a few who have gone on their own and continued to volunteer their time with younger teams. How has your team grown since you've been their head coach? My Minor Bantam A club has grown in a variety of ways this year. First and foremost they now all appear to be having fun and enjoy coming to the rink once again. My Coaching staff and I made it a goal this year to not only try to develop the players as best as we could based on individual and team tactics that were age appropriate but to also rebuild their confidence in themselves, the belief that they could compete all the while ensuring that they have fun. I am extremely proud that they have all taken steps both on and off the ice to grow as a team, as players and also as individuals off the ice as well. You serve a number of roles within the organization. How do you balance your time between all of your responsibilities? The calendar function on my phone gets a daily work out and there have been times when it’s been difficult but for the most part I am extremely grateful for the coaching staff members that I have as they relate to my teams and the many great volunteers in my house league. I have also been very lucky that the schedules for everything that I am involved have rarely conflicted so whether its coincidence or a big thank you to our associations ice scheduler, either way I am grateful! Please note that all previous submissions are still eligible for upcoming Coach of the Month awards and do not need to be resubmitted.